Iperius is a backup software for VMware ESXi, vCenter and ESXi Free. It is powerful, complete, and extremely easy-to-use. It supports incremental and differential backup of ESXi (CBT/VDDK) virtual machines, including the free ESXi Free version. Iperius also allows connections via vCenter and the automatic restoration of virtual machines, including on different hosts. These powerful features make up a complete framework for protecting any server infrastructure, with features such as Hyper-V backup/restore, SQL Server database backup/restore, and Exchange mail servers. Finally, Iperius supports the replication of virtual machines from datastore to datastore and from host to host, to have an exact copy of virtual machines always ready to be started in case of malfunction or crash of the main machine. Replication can also be planned and performed on multiple destinations, thus enabling an optimal failover policy. Complete backup utility with many other features. N.B. : For the incremental and differential backup of virtual machines (CBT), the operating system where Iperius is installed must be 64-bit. First, you must create a connection account to the ESXi server (host) o vCenter. To do that, click on the dedicated button as shown in the picture below. Creating an account is very easy: you simply have to specify the ESXi host IP address (or vCenter server), the username and the password. Basic settings are very few. In the VM explorer on the left you can select one or more virtual machines, then you can specify a backup destination, which can be either a local folder or network share (in this case it might be necessary to specify an account to authenticate in the shared folder). It’s, therefore, possible to select the backup type. 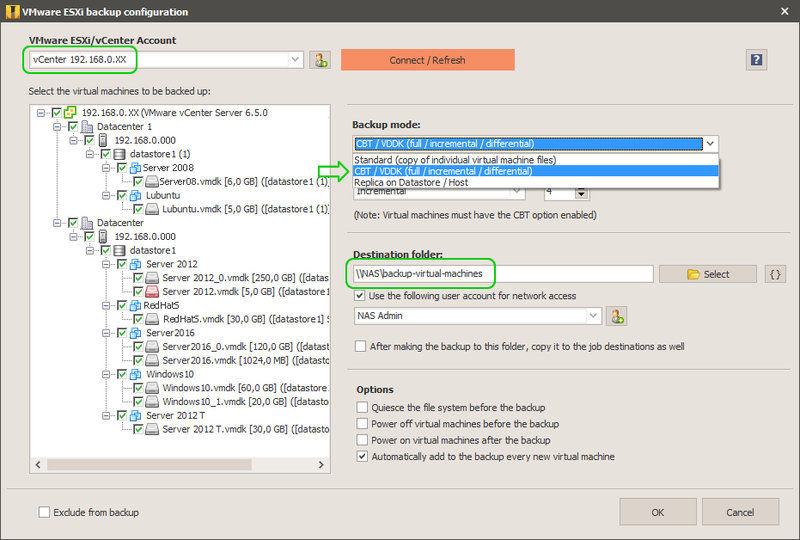 It’s also possible to use the Changed Block Tracking mode (CBT) which allows for incremental or differential backups of virtual machines by using the VDDK VMware libraries, and only the disk space that is being used (for this mode we must remember that the virtual machine should not contain snapshots and must have the CBT option enabled). This kind of backup is very fast and powerful, and also allows you to have a larger number of complete backups. During the restore procedure you can choose which incremental, differential or total backup you would like to use to restore the machine. 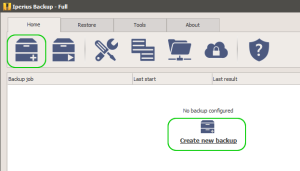 For this backup type you can also choose the “Number of backup”, that is the number of copies to keep. 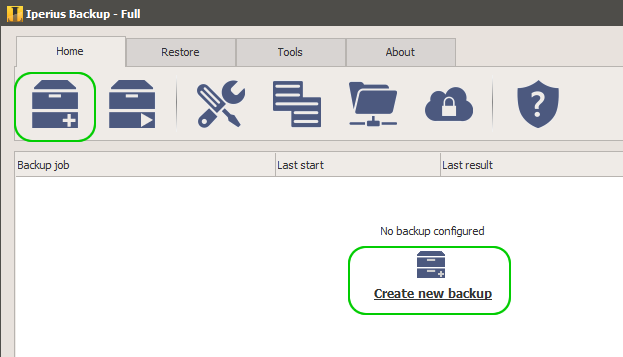 For example, if you choose as Backup Type “One full backup + Incremental backups” and Number of backups equal to 3, it means that Iperius creates a full backup and two incremental copies where will be saved new and modified files. These copies will then be overwritten on each new backup cycle. Standard backup mode, also available in versions of Iperius prior to version 5, allows you to create an exact copy of individual files from a virtual machine file, downloading them locally in their entirety. This is always a full backup, which produces a folder containing all virtual machine files (.vmdk, .vmx, etc …), in the same state as they appear in the datastore. That said, save the virtual machine backup item by clicking OK. Specifying a destination is not mandatory (since the destination is already included in the item). Skip the panel Destinations, unless you want to copy the backup to further destinations (i.e. Tape/Cloud/FTP). With a standard configuration the backup is much faster when Iperius is installed on a physical machine (external) in the same network of the ESXi server, while it can be slower when Iperius is installed on a VM hosted in the ESXi server itself. Anyway, to improve network performances and to solve possible problems, it’s recommended to read the related VMware documentation: http://kb.vmware.com/selfservice/microsites/search.do?language=en_US&cmd=displayKC&externalId=1004087 . Backups made using the CBT/VDDK mode will be much faster than standard backups. This is due to the fact that with a full backup, only disk space that is actually being used will be downloaded, as well as the fact that incremental and differential backups only download any detected differences and are therefore very fast. Iperius version 5 and later versions include a simple and powerful ESXi virtual machine restore function. The restore can be done either via a standard backup (always a complete backup) or via a complete, incremental or differential backup created using the CBT mode. 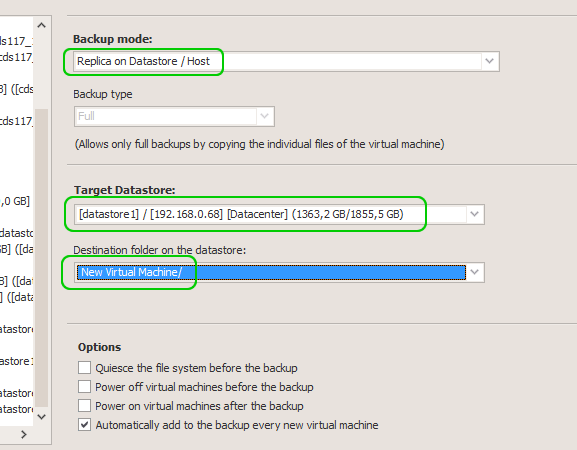 Using the second option, Iperius will automatically rebuild the virtual machine using various incremental or differential backups, thus allowing for a fast restore of a virtual machine from a certain date. The restore can also be completed on different hosts, datacenters or datastores – making this feature very useful for cloning/replicating virtual machines. 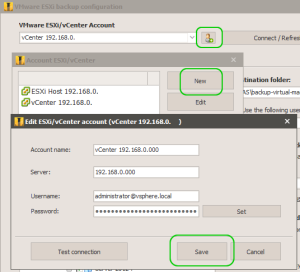 You will also need to select a connection account for ESXi or vCenter (or create one if necessary), you will then need to select the datastore that you want to use for the restore (which can be on a different host or datacenter than the virtual machine source), and then select the folder containing the virtual machine backup. At this point, all available backups will be displayed and you will be able to select what to do with the restore. Lastly, in order to achieve a smooth restore, the virtual machine doesn’t need to be present in the selected destination. 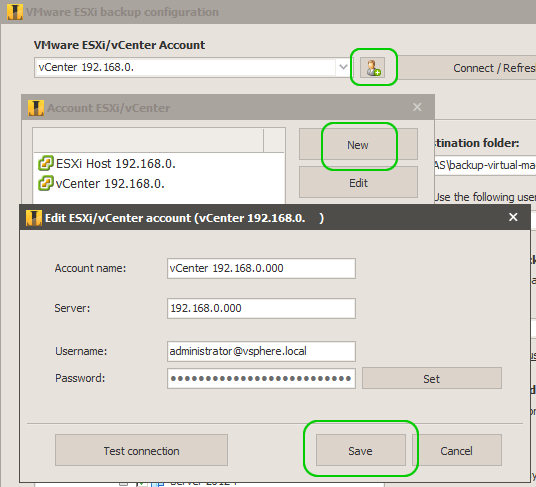 Restoring an ESXi virtual machine that you’ve previously backed up with Iperius (standard backup) is very simple. In fact, Iperius saves the virtual machine in its original format (with the various .vmdk, .vmx files, etc. ), so you will simply need to reupload the folder containing the backup to the ESXi datastore (using the standard management software provided by VMware, vSphere Client), and then reconnect the virtual machine simply right clicking on its .vmx file and then on the menu item “Add to Inventory”. Once you have done this, you can immediately restart the virtual machine. This same operation can be used to register and start the virtual machine replicated by Iperius directly from its replica. You can, in a few seconds, start again a virtual machine that has stopped working. Hello it is possible to backup one Disk from the virtual machine. so i can backup weekly the System and the Data Files daily. Hi, currently it’s not possible to select individual disks. However, for data disks it might be a better strategy to install Iperius in the VM and make an incremental backup of files. It would be faster and easier to restore. Is it possible to perform incremental or differential backup for VM on ESXi? No, currently it’s not possible, unless you also install Iperius on the virtual machine. What means to install Iperius on the virtual machine, if I install again one on the virtual machine which I want to backup, can I do the incremental backup? Yes, in that case you can make incremental backups. You can make file-by-file backups, incremental or differential, and drive image backup (block level backup). Any estimate for that feature? Iperius 5.0 now fully supports incremental and differential backup of virtual machines (Changed Block Tracking). 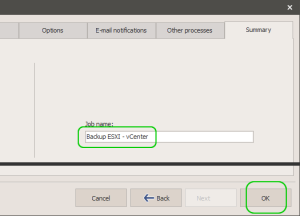 It also support the connection to vCenter, the automatic restore and the possibility to exclude individual disks. pourriez vous m’expliquer cette erreur, et me donner une solution ? Votre problème vient du fait que vous avez des caractères spéciaux dans le nom d’une de vos VM ou dans le nom du datastore (certains caractères spéciaux ne sont pas supportés par ESXi pour certaines actions). Pour résoudre ce problème, vous devez donc soit changer le nom de votre VM soit l’exclure. Buen día, e realizado un backup de una maquina virtual entera, cuando quiero restaurarla desde Vsphere y no muestra como valido el archivo. was the backup completed correctly and without errors? What kind of error is shown by vSphere Client when you try to start the VM after you added it to the inventory? Nous testons votre logiciel , pour trouver une solution globale de backup . Nous n’arrivons pas à nous connecter à nos VM via notre vcenter , et seulement par nos ESXI 6.0 . Hi, yes, currently Iperius can only connect directly to ESXi hosts. Connection through vCenter will be available soon. Nous retestons votre logiciel pour savoir si on peut a présent se connecter sur le Vcenter . il semble que non . Le problème est que dans le cas du vSphère DRS , les VM sont suceptibles d’être déplacée des ESXI , ce qui rend la sauvegarde en erreur . Hello, currently Iperius can only connect directly to the ESXi hosts, not through the vCenter. However, this feature is quite ready, if you wait a couple of week it will be released in the next version of the program. When backing up Ubuntu 16 Server VM’s from an EXSi host I receive errors: There was an error downloading the vmdk, The remote server returned an error: (500) Internal Server Error. Any ideas? Works fine for all our Windows and CentOS VM’s. Also, is the option to exclude certain disks from VM’s planned to be implemented? Can we do a file level recovery restorel on a backup of a certain virtual machine? Imagine i want to restore one or two individual files included on a disk of a certain virtual machine. Hi, if you make a standard backup, where you have the .vmdk disk file in its original format, you can mount the disk to recover individual files. .VMDK files can be opened also with 7zip and so you can extract individual files like from a normal zip archive. I’m evaluating this product, however… I can’t even connect to my esxi server. Andres, did you ever get a fix for this? I’ve contacted support and all they told me to do was to check the PC had all its updates. I tried it on a Windows 7 x64, and Windows Server 2008R2. All were up to date. I then tried on a brand new Windows images and updated it to the max – still failed. Hello, please continue the discussions using our ticketing system on https://support.iperius.net. We will help you on solving all the issues. Version 5.5.2 could not connect to esxi server. Didn’t have “Error: Generic exception: Error during get info from directory ..” with version 5.5.0 before. I think they are pushing updates that has not yet been fully tested with vmware exsi. I’m evaluating this product and I’m not sure … can I make backup virtual machine from free ESXi 6.5 without stoping this machine ? Can I make backup virtual machine from free ESXi 6.5 without instaled VMware Tools on this machine? Thank you for having open a ticket, we will continue the discussion there. I’m evaluating Iperius Backup, to back up VMware ESxi / Vm’s & MS SQL server, presently using Backup Exec for SQL & another package for the VM’s. VM backup data is stored on a file share and Backup Exec picks up from there, my question is, Backup Exec supports the Dell Tape library, can Iperius do the same? Currently Iperius Backup doesn’t support library, but it’s a feature that will be added in the next releases. If you switch the tape manually, however, the backup works. If you need more technical support, open a ticket on https://www.iperiusbackup.net. When creating the account, I can test the connection successfully; I only get the error when trying connect when setting up a backup. I’m using the latest version in Eval mode. Happy to open a ticket if needed/allowed. Iperius Backup is compatible with ESXi version greater of 4.1. In the Restore by using vSphere Client section, it talks about simply uploading the set of backed up files back into the VMware server (in my case, using VSphere Client and the VMware ESXi V 5.5.0,free version), I would like to test the back up by starting this restored file. the plan was to back up a VM to my desktop system, start up the VM, make some changes, shut it down, upload the backup, start up THAT VM and see if I ‘went back in time’, verifying that the restored system is operational. Turn that one off, start up the original system, verify that is indeed the original system with changes. I am concerned that VM server might be confused as to which files it will refer to if the file names are the same, despite in different folders when I perform the import (of the back up VM). Is there any measure I can take to ensure this will not happen? Any other issues I should be aware of? When you restore an ESXi VM with Iperius Backup, the software allows giving a different name to the virtual machine that has to be restored and however, in any case, does not allow to overwrite the already existing VM. For more technical support, please open a ticket on https://support.iperius.net. How to replicate a VM from one ESXI host to another ESXI host without a VCENTER, I have tried to do so but do not show me the destination datastore in the other ESXI host only the TARGET DATASTORE what is the same DATASTORE in the ESXI host that I am conected. Currently, the replication is possible from host to host only if they are connected via Vcenter. However, we are working to also allow the replication between two hosts not connected by V center, in a few months will be available. Hi vm replication available for hyperv? The Hyper-V replication is not yet supported, however will be added in the future releases of Iperius Backup.